In 1996, the former President Gonzalo Sanchez de Lozada enacted the Hydrocarbon Industry Law no. 1689, allowing the privatisation of the State-owned company Yacimientos Petroleros Fiscales Bolivianos (YPFB) and the exploration and exploitation of Bolivian natural resources by foreign firms. The Bolivian plan for exporting natural gas by ship from a Chilean port to the United States and Mexico was managed by a consortium called Pacific LNG (liquefied natural gas) made up of the oil companies Repsol-YPF, British Gas and Panamerican Gas, all of which were paid for by British Petroleum. 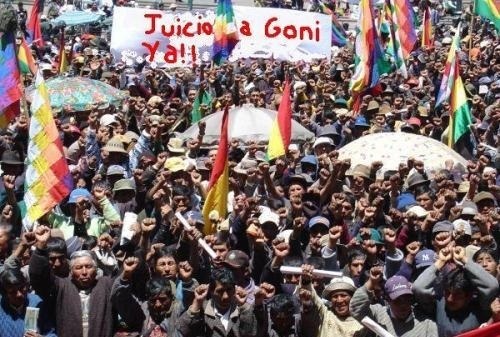 Bolivian citizens opposed and protested against Lozada's goal of exporting most of the nations natural gas. Lozada's Government encouraged the sale of Bolivian natural resources to overseas companies, and these companies used the new legislation to take control of Bolivian gas reserves. The export of natural gas began at the Margarita gas field, the country’s largest deposit, located in the region of Tarija, which produced 700 billion cubic feet of natural gas and 30 thousand barrels of oil per day. The concession for exploiting this area was granted to the company Maxus Bolivia, a Repsol subsidiary, in partnership with British Gas and Union Texas of Bolivia. From there, gas was to be piped to the Pacific coast, and transported by ship to the west coast of North America. An important part of the project was the construction of a gas pipeline passing through the Andean Mountains and linking the gas field with two liquefaction plants in Mejillones, on the Chilean coast, where the gas was liquified and loaded on ships. The liquefied gas was then taken to a re-gasification plant built in Mexico, near the Californian border, to be returned to its gas form and finally re-joined to the US network of pipelines. The investment for the 20 year project totalled US$ 4 billion, of which only US$ 1,2 billion was for the construction of the gas pipeline on Bolivian territory. In August 2003, on hearing of the Governments natural resources export plan, local communities and organisations began protests. In October 2003, known as the "Gas War", millions of farmers, indigenous and ordinary citizens, COB trade union, along with community organisations, began widespread protests leading to increasingly violent clashes with Bolivian armed forces. By the end of the fighting, 84 people were killed, 400 were wounded and as many tortured. This opposition by Bolivians led to the fall of the de Lozada Government, and the opening of discussions about the nationalisation of hydrocarbons. On May 6, 2005 the Hydrocarbons Law was finally approved by the Bolivian Congress by Vice President Carlos Mesa, but protesters argued that the new law did not go far enough to protect the natural resources from exploitation by foreign corporations, demanding a complete nationalization of the gas and process in Bolivia. On May 1, 2006 president Evo Morales signed a decree stating that all gas reserves were to be nationalized. Still the exploitation of fossil fuels (gas and also oil) mixes Bolivian (YPFB) and multinationals’ investments while there is questioning of the current extractivist model by the Bolivian government on the contrary, natural resources exploitation is exponential, representing the main source of revenues for diminishing poverty. Project Details The export of natural gas began at the Margarita gas field, which produced 700 billion cubic feet of natural gas. Why? Explain briefly. The Bolivian "Gas War" led to the fall of liberal de Lozada's government and path the way to the indigenous movement under Evo Morales. However, the conflict cause the death of more than 60 people. Mal de altura, Viaje a la Bolivia insurgente. Colectivo Situaciones 2005. Dignidad y juegos de poder en el tropico de Cochabamba. CASDEL.2002. El pachakuti ha empezado -Pachakutixa qalltiwa-. Si se pudo, si pueblo no es cojudo. Octubre de 2003 y las primeras acciones del presidente. Varios autores. Esteban Ticona Alejo, com. 2006. Impactos ambientales, sociales y culturales de REPSOL YPF enterritorio indigenas de Bolivia. Monitoreo indigena independiente del pueblo guaranì - APG-Itika Guasu, 2005.